The history of segragation in the United States Armed Forces has many facets. In last year’s Courage Has No Color, Tanya Lee Stone looked at the Triple Nickles, an all-black parachute battalion whose skills were never utilized in combat. 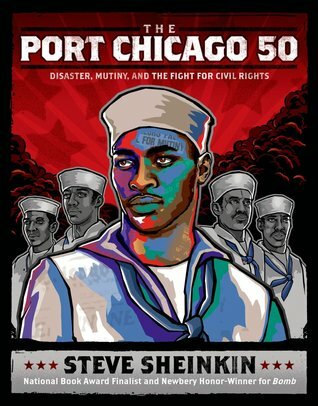 Steve Sheinkin’s The Port Chicago 50 examines discrimination that was far more dangerous and destructive by presenting the story of the 50 black sailors who were convicted of mutiny in 1944 after they refused to load ammunition. The case against them didn’t provide strong evidence of a premeditated plot to subvert or usurp authority, and their defense attorney failed to use important information, like the fact that only black sailors were assigned to load bombs, and that they were working in unsafe conditions. By using interviews, court transcripts, and other primary sources, Sheinkin allows the men to tell their own story. It’s probably the most powerful way for readers to hear their story, and it’s a smart literary choice. There’s not a lot of authorial intrusion here (and I’ll get to voice later) except to craft the narrative so that context and history are given at appropriate times. The theme of racism from individuals and systems of authority is ever-present in this book. Many of the Port Chicago 50 were teenagers, a fact that is mentioned more than once, allowing teen readers to think about them as friends and peers. Sheinkin chooses to leave readers with the relatively positive message that the Port Chicago 50 stood by their desire to be treated fairly, which is entirely appropriate for this book. But as we’ve seen over the past few months, the long history of violent conflict between white people in authority and black youth is complicated, and a step into those muddier waters might have created a more thematically challenging book. It’s only fair though, to judge the book as it is. Sheinkin has a recognizable voice and cadence in his writing. He likes to end chapters with the single-sentence paragraph “button”—that stylistic flourish on which I’ve already expended enough words—and his style is crisp but conversational; he’s that really cool history teacher who gives the best, most engrossing lectures. Although his use of language is mostly utilitarian, it serves The Port Chicago 50 well because he has so many primary sources to draw upon for this distinct narrative. As Sarah has already mentioned, this is a strong year for nonfiction. Port Chicago should absolutely be in the conversation for major awards, but it might not have the literary muscle to go the distance for the Printz. If, however, it’s not a finalist for the YALSA Award for Excellence in Nonfiction (seriously, can we get a snappier title for this one? ), I can’t be sure of anything in this world. Two years ago, Sheinkin’s Bomb was an awards darling; does The Port Chicago 50 have the same chances in a much more competitive year? Do you have plans to use The Port Chicago 50 or other YA literature to help teens work through the history of civil rights and racism in America? Share your thoughts in the comments.